Four sizes of aluminium collars to fit guide bushes with diameter 'A'. Enables single shaped templates to be used to cut perfectly matching pocket and inlay. Collars have integral rubber 'O' rings to ensure collar secures onto guide bush. Templates should be made with minimum corner radius of (1/2 x collar diameter 'B'). 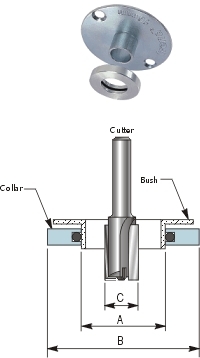 The correct diameter straight cutter as shown 'C' should always be used. The guide bush must be ordered separately.